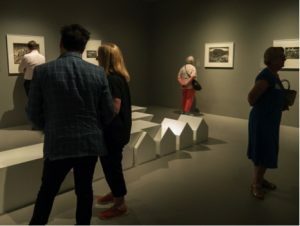 National Gallery of Victoria’s (NGV) Escher X nendo exhibit is the latest in the gallery’s summer exhibits, following the roaring success of 2017-2018’s Triennial. Zara Sigglekow of Artguide called Triennial an exercise in mass spectacle, theatre and immersion, and Escher X nendo achieves the same feat. It is an immersive experience, not just an exhibition. 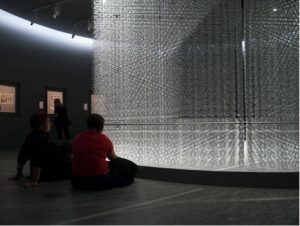 As guests move through the exhibit, they become part of the art, nendo’s design elements drawing them in and leading to a feeling of tumbling into an Escher artwork. I was first introduced to the works of M.C. Escher at age 11. I was attending a school holiday program at a university, and though most school holiday programs are a cross between forced exercise and glorified babysitting, this one was different. We learned the basics of photography, and the principles of advanced mathematics. I loved the photography. The mathematics made my head hurt. They still do. At the end of the program I was gifted a small book of jigsaw puzzles, some of M.C. Escher’s tessellation prints. Most people are at least vaguely aware of these prints. Colourful lizards, birds and fish fit together in an interlocking tapestry of pattern that appears as if it could go on forever. After piecing them together, I would stare in wonder at how the birds and fish could exist together, but not at the same time. My brain had to alternate looking at one then the other. It fascinated me. This mixture of whimsy and mathematical precision is largely why Escher’s prints are so popular. Despite how popular these prints have become in classrooms, bedroom walls and the offices of academics, Escher did not gain commercial or critical success until the 1950s, three decades after he began printmaking. 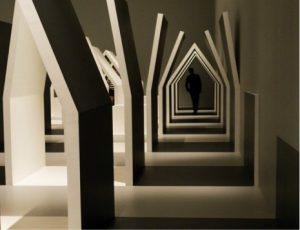 The first space in the NGV exhibit is pitch black – a 17-metre corridor, around three times the width of a regular hallway. Here, Japanese design firm nendo have created a digital projection artwork that brings the viewer into the world and perspective of Escher, before introducing his art. This space is named form of a house. Small pinpricks of light dance across the darkness from above, and onto the viewer as they move through the space. These dots are intended to represent the seeds of ideas, blossoming and transforming. They undulate down the room, and pull the viewer towards the next experience. Eerie music plays. The viewer is gently encouraged to change the way they see the world for the remainder of their visit. This space is the first time we see nendo’s depiction of the house. Repeated throughout the exhibition, this first space shows us the seeds of ideas coming together and forming the house. It quickly dissolves and scatters into more seeds of ideas, that scatter and form again. This space shows us why nendo is billed equally with Escher in this exhibit. They have created not only a space for Escher’s work to be displayed, but a commentary and conversation on the themes behind it. 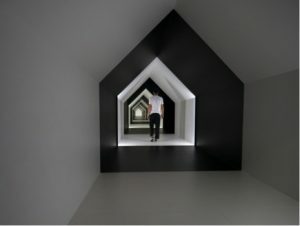 In the NGV media release, Tony Ellwood, Director of NGV, says the pairing was inspired by both artists’ manipulation of space and perspective. “Escher’s artistic practice, due to its complex play with space, logic and mathematics, has had an indelible impact on architecture and design for many generations. This rich legacy was the catalyst for the NGV to conceptualise the idea of pairing Escher with nendo,” says Ellwood. Moving through each space in the exhibit, a story of Escher’s creative journey emerges. After moving on from the seeds of ideas in form of a house we find some of Escher’s earliest prints. These are paired with nendo work arising house. The house repeats here, appearing to emerge from a bench seat on which viewers can sit and contemplate. Escher’s ideas began to arise during his time in Italy, when he made many landscape prints that can be viewed from the arising house seats. The seed of the idea has started to realise. The images from the jigsaw puzzles I spent hours poring over as a child are held in a space called transforming house. The warehouse-sized room contains many of Escher’s tessellation works, shapes that interlock to completely cover a surface. Escher’s preparatory sketches are fascinating, giving an insight into how he came to understand the complicated maths behind the tessellations. The transforming house space is reached by climbing a set of winding stairs. The room itself also transforms at this point, with a change of music. Escher loved J.S Bach’s Goldberg Variations, a selection of which is played in this space, creating a completely different feel to the preceding rooms. Many of the works in this space were created by Escher while listening to this music. But the true success in transforming house is the space itself. A bench on the upper level has a row of barstools, inviting viewers to sit. The stools allow the viewer to sit and overlook a scene below them, that for a moment appears to be an Escher work brought to life. It’s actually a series of black and white houses created by nendo to form a gallery space. The space below contains four black houses that gradually transform into five white houses. People moving through the houses and adjusting their poses for the perfect selfie adds an almost performative element to the art. Descending the ramp below the bench creates a sensation of transformation from viewing the art, to entering it. 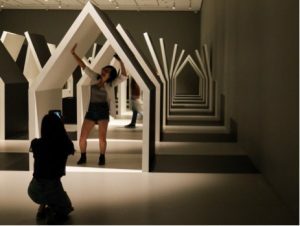 Moving down into the rows of houses that seem to somehow grow, expand and collapse upon approach is a truly bizarre experience, and fosters an appreciation for how important nendo’s contribution to this exhibit is. Another nendo standout is gathered house, a circular room that contains 17 Escher prints. All deal with the notion of infinity, as does the room itself. Centred in the room, a spectacular chandelier made of over 55,000 small houses is suspended from the ceiling. Black and white, the houses repeat themselves with another form of a house in the centre of the chandelier. Viewed from one side of the room, a white house on a black background. Viewed from the other side, a black house with a white background. The piece asks us to ponder the nature of infinity, and the importance of perspective in shaping our reality. nendo’s final work snake house contains Escher’s final and most technically accomplished piece. Escher created Snakes (1969) in the final years of his life. Amidst failing health and eyesight, Escher used a huge magnifier to meticulously carve the woodblocks used for the print. The three wedge-shaped woodblocks that Escher used three times each to create the final print had to be perfectly aligned. This process was repeated for each colour, red, green and black. Escher’s mastery of the printmaking process at this point in his life was unparalleled. An entire room is devoted to the piece, with the space snaking around to lead to the impressive print. While striking, the piece would be better appreciated if paired with information allowing viewer to comprehend what a technical feat its existence is. While the room also contains a preparatory sketch by Escher, the woodblocks themselves are notably absent. In this, the snake house space falls flat, and feels like a deflating end to the exhibit. Despite this, the exhibition is an overall success. Nendo’s clean and ultramodern design elements create a delightful world for Escher’s work. Their juxtaposition against the playful prints showing Escher’s love of precision and illusion means that nendo and Escher are truly in conversation in this exhibit. My childhood memories of looking at Escher’s works in wonder are well and truly intact, along with a new appreciation of how Escher fits into our modern world. Jessica Leonard is a first-year Media and Communications student at Latrobe, majoring in Media Industries.